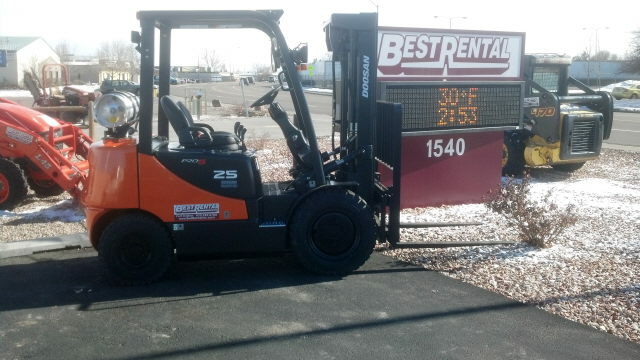 FORKLIFT DOOSAN 5000LB Rentals Ft. Collins CO, Where to Rent FORKLIFT DOOSAN 5000LB in Ft. Collins, Wellington, Greeley, LaPorte, Loveland, Windsor CO and all of Northern Colorado. 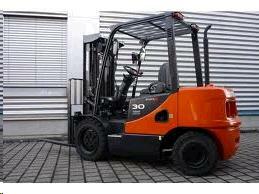 Lift capacity 5000 lbs. Overall weight 9510 lbs. Overall width 46"; Height 7'2"; Length w/ forks 12'1"
Load height w/ mast extended 12'7"; Total height w/ mast extended 14'7"
Forks - 4" wide, 41" long. Adjustable fork width up to 38" outside. * Please call us for any questions on our forklift doosan 5000lb rentals in Fort Collins, Wellington, Greeley, LaPorte, Loveland, Windsor CO and all of Northern Colorado.